It’s that time again! Time for MaconBacon. With only 200 tickets available it’s time to sign up now! The Kolbe Center is happy to announce that the building at 833 Walnut Street, which was the planned site of the Summit Center abortion business, has been purchased by Richard and Suzanne Rowe and the lease with Summit Center was terminated as a condition of the purchase; consequently, the abortion business will not be coming to Walnut Street. 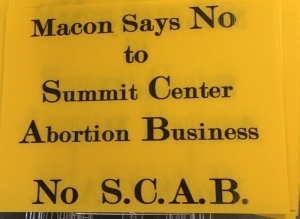 The Kolbe Center will remain vigilant for any effort by Summit Center to secure another medical office building in Macon or the surrounding area and will oppose this if it should occur. The Rowes are going to make the building at Walnut Street available to the Kolbe Center. An architect will provide renovation plans and the Kolbe Center will need help with funding the improvements in the coming months. Upon completion of the building rehabilitation, the Kolbe Center will relocate to the Walnut Street address, thus restoring with life a building which was destined to be a chamber of death! More to come. Amen. Hallelujah!